Book reviews and selected reposted content for the business side of the technology industry . Some of the best from 600 plus feeds. In the B2B online marketing world, conversion forms on targeted landing pages have become the core tactic for converting an unknown website visitor into an identified lead. As we’ve covered in past blog posts, there are two stages for these leads – Marketing Qualified Leads (MQLs), which then get classified as Sales Qualified Leads (SQLs). But without well-crafted landing pages and a thoughtful conversion form, you’ll quickly learn that you’re missing out on securing conversion opportunities or that you’re converting a high number of unqualified leads that aren’t being filtered out by asking good questions. Here’s a look at four core dimensions of conversion form best practices that will aid you with creating better forms for your own B2B lead generation. Don’t rely on your landing page body copy alone to compel a lead to complete the desired task of completing your conversion form. 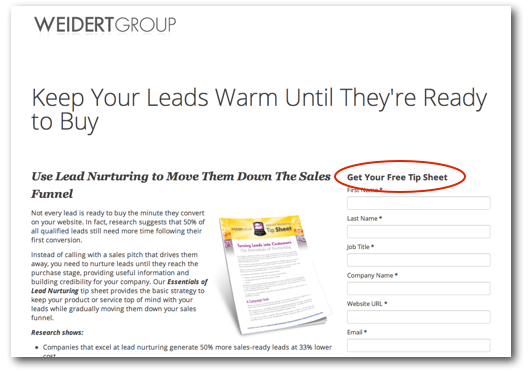 Utilizing a simple headline directly above the form reminds the lead what the next step is in order to receive their free content download, assessment or whatever else you’re offering in exchange for their contact information. Making sure to use action-oriented language such as “Get Your Free ____ ” or “Download Your ____ Now!” is key rather than just saying “Please Complete the Form”. One would think a shorter form would result in better overall conversion rates, and this is often true, but this also tends to result in a higher number of lower quality leads (aka “noise in the funnel”). If you begin by asking yourself what initial information you need to qualify or disqualify a lead, you’ll construct forms that ask meaningful questions and aid you when the leads start rolling in. The mad scientist in the Inbound Marketing world, Dan Zarrella, has found in his research that 3-5 form fields yield the highest conversions rates as shown below. 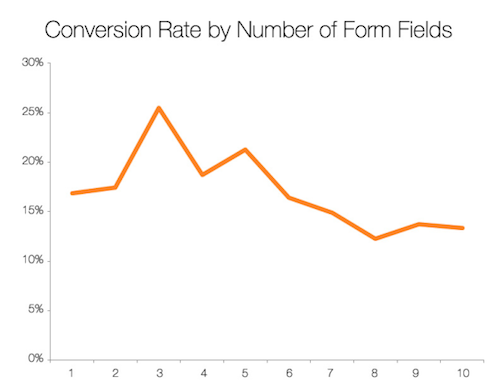 But even forms with 7 or 9 fields the conversion rates are still close to 15%. An often overlooked aspect of creating well crafted forms is the sequencing of your questions. Ease the lead into the conversion by first asking who they are (First Name, Last Name, Job Title, Company Name, etc.) then ask for their basic contact information (Email, Phone Number, etc.) and additional qualifying questions (Annual Revenue, Budget, Timing, etc.) based on what aids you during the sales process. One of the many reasons we love HubSpot’s Inbound Marketing software for our own lead conversion efforts, and clients’ efforts, is the ability to build smart forms that don’t ask the lead the same question twice. Once we’ve obtained specific information on who they are and how to contact them, we can ask more qualifying questions (questions they haven’t received from us before) the next time they convert. This begins to paint a much clearer picture of which leads are the most qualified and ready to be contacted directly. The final step of any landing page form conversion is when the lead makes the decision to “submit” their information in exchange for what you’re offering. But is the word “submit” the most friendly and encouraging phrase to use? You should have the ability to customize this button within your website so do some experimenting on what works best! Try working off of the form headline and use a similar action-oriented phrase. If you’re offering a free content piece, try “Download Now”. It’s succinct, feels less threatening than “Submit” and encourages instant action. With anything related to online marketing efforts, use the power of analytics to test and analyze what conversion form elements work best for your B2B business. 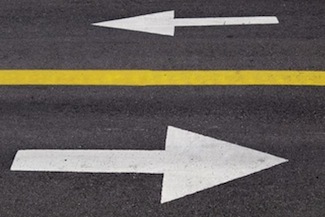 Every business has different lead and buyer types that may react differently to different questions and language, so leverage these best practices to guide you on your way. Here’s to more qualified conversions, my friend!